This January, everyone's favorite reluctant traveler returns to the departure gate when AN IDIOT ABROAD 2: THE BUCKET LIST touches down at SCIENCE. After his tour of the Seven Wonders of the World, Karl Pilkington could be considered an international jetsetter, however, his recent global exposure has made him even more resistant to the call of the open road. Nevertheless, world-class tormentors Ricky Gervais and Stephen Merchant prove that one man's anguish can be another man's amusement, as they send him around the world to fulfill his Bucket List. Now Karl can only hope that his quest to accomplish the definitive list of "things to do before you die" doesn't kill him first. 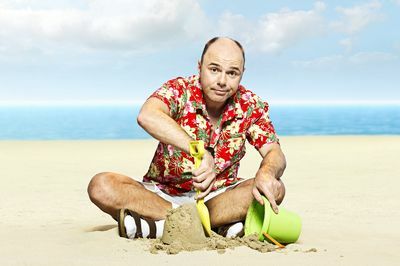 AN IDIOT ABROAD 2: THE BUCKET LIST premieres January 21 at 10:00 PM (ET/PT). "I oppose all animal cruelty and unnecessary experimentation in the name of science. Thankfully Karl Pilkington is 'technically' human," said Gervais. In the second installment of the franchise, Karl is coerced into round two of the world's most ridiculous social-experiment as Ricky and Steve use the planet as their playground - compiling the most outrageous to-do list ever concocted. Having learned from his last trip, Karl only agreed to do another series if the rules changed - so this time he could choose where he goes and what he does from the Bucket List. Even with the opportunity to pick his poison, however, each task results in an adventure in absolute absurdity. From bonding with the Amish, to diving with sharks, to taming a deadly cobra, Karl's adventures are loaded with the same unpredictable - yet hilarious - surprises from his puppet masters back in London. "AN IDIOT ABROAD changed the game for SCIENCE when it became our highest rated series ever" said Debbie Adler Myers General Manager and Executive Vice President for SCIENCE. "Viewers come to our network for thought provoking content, so it's no surprise they became addicted to the brilliant, sharp humor made famous Ricky Gervais and company. At SCIENCE we inherently question everything, and no one asks more questions than Karl Pilkington." Premieres January 21 at 10:00 PM (ET/PT) Karl's first 'to do' is to spend the night on a desert island in the South Pacific. Soon after he arrives, a new type of vacationing interrupts his visions of relaxation. Karl then goes bungee jumping with some natives, spends some quality time with a Prince Phillip-worshipping tribe, goes arse boarding, and models some very exotic underwear. Premieres January 28 at 10:00 PM (ET/PT) The next destination for Karl is a trip aboard the Trans-Siberian Express. The trail - which starts in Russia and ends in China - is Karl's most hated place. He's hoping for luxury, but Ricky and Steve have other ideas. Karl receives an intense Russian steam room rubdown, stops over at a dwarf village, and is buried alive to experience ritual customs of the natives. Premieres February 4 at 10:00 PM (ET/PT) Karl heads off to Australia to tick off an iconic Bucket List item: swimming with dolphins. Before he touches down in Oz, Ricky and Steve have a planned a little stopover in Thailand. After being given a makeover by the famous lady boys of Thailand, he is entered in blindfolded Thai kickboxing contest, and sent to village inhabited by 100s of deadly snakes. Finally, when Karl finally arrives in Australia he discovers he is not going to swim with dolphins, but instead dive with Great White Sharks. Premieres February 11 at 10:00 PM (ET/PT) Karl is hardly prepared for the arctic conditions he faces in Alaska. To fulfill his adventure here, Ricky and Steve have planned some dogsledding, a meeting with the Innuits, and a visit to the North Pole. When Karl finally gets to catch his whale-watching cruise, he learns that his cohorts have stuck him on a deep sea fishing trawler. Premieres February 18 at 10:00 PM (ET/PT)Karl is off to Africa to meet a gorilla before traveling to Uganda. Ricky and Steve want Karl to have an authentic African experience, so they arrange some time in a slum for him help rebuild a shelter. Karl visits Jessica the Hippo, and Ricky sends him to join a Rhino conservation project. Lastly, Karl is sent on a journey through the impenetrable forest in Uganda before coming face-to-face with a gorilla. Premieres February 25 at 10:00 PM (ET/PT) Karl has always wanted to drive along the iconic Route 66 in an open top Cadillac, but Ricky and Steve have a few other items to add to the list. Along the way, they want him join a high school choir, hang out with New Age therapists, and meet the Amish. Karl finally wraps up his American adventure by wing walking on a plane. Premieres March 3 at 10:00 PM (ET/PT) Karl is off to Japan's most spiritual destination: Mount Fuji. Here he completes a 15-hour trek to the summit of Mount Fuji filled with unexpected surprises. He then stays overnight in a 'capsule' hotel, heads to a Sumo wrestling match, and goes for a ride on the world's steepest rollercoaster. 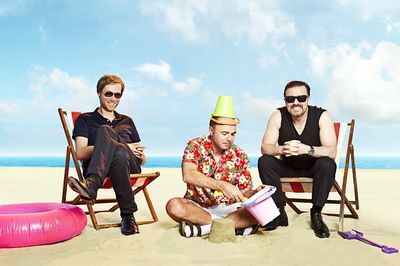 Premieres March 10 at 10:00 PM (ET/PT) Karl returns home to London to meet Ricky and Steve and reflect on his adventures tackling the Bucket List.